ZenHub dependencies allow teams to track dependent relationships between pieces of work. 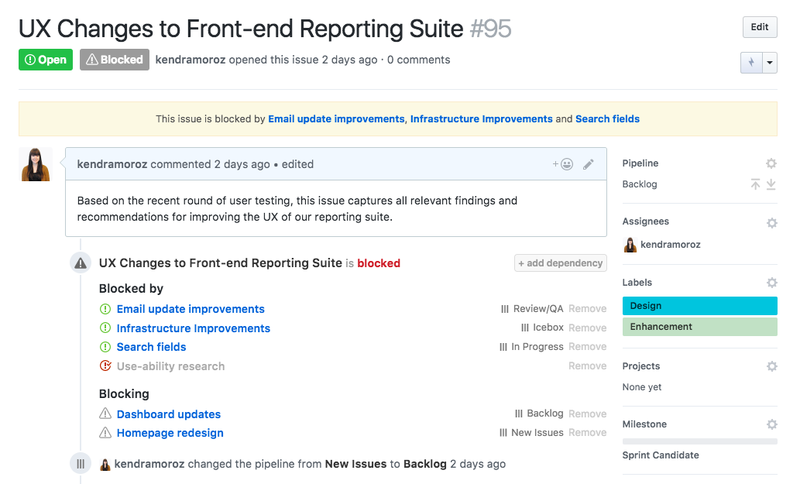 Whether an Issue is blocked by or blocking other pieces of work, use dependencies to communicate what&apos;s needed to complete a bundle of tasks or user stories. Dependencies are helpful even if your team members don&apos;t work with code! A dependency is a project management term used when referring to a relationship between different tasks where one piece of work relies on another one before it can be considered ready to be worked on. With dependencies, teams get a more explicit way to know what to work on first. If an Issue is blocking 5 others, or a small Issue is blocking a critical fix, teams get instant visibility as to why other work is not yet progressing. Regardless of how teams leverage GitHub Issues to track projects or pieces of work, dependencies provide a visual way to increase communication around potential blockers. Check out the full guide here to learn more about creating dependencies using ZenHub with GitHub Issues and Pull Requests. ZenHub is now available across all browsers and mobile devices! Seamlessly integrated with your GitHub data, teams can now access ZenHub Boards, Reports, Epics, dependencies, and more in Chrome, Firefox, Safari, or Edge as a web app. With a fully responsive experience, ZenHub is also now accessible on iOS and Android through mobile-supported versions of Chrome and Safari. Using the ZenHub web app, you get all your important project data in one place without having to sift through additional tabs and GitHub features. 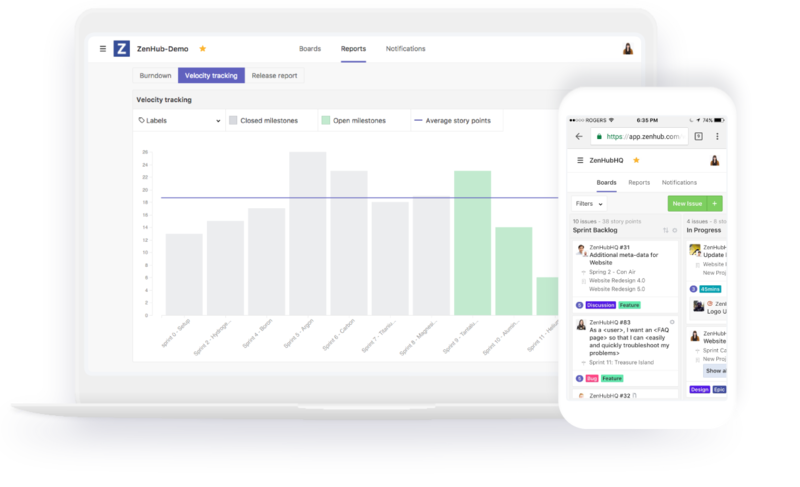 Packed full of all the same features you know and love in GitHub, you can still update Issues, stories, specs, and sprints while accessing ZenHub&apos;s robust reporting suite and track and plan functionality—but in a faster and easier to use interface. Ready to get started? The ZenHub web app is in early-access, exclusive preview! To get access and join your team&apos;s exclusive preview group, e-mail your ZenHub administrator or get in touch with us at enterprise@zenhub.com. Multi-repo Boards can only be created using the ZenHub Extension. Markdown checklists using - &lsqb; &rsqb; can only be created using the ZenHub Extension or native GitHub UI. Image and files uploads can only be done using the ZenHub extension or native GitHub UI. When viewing Issues from the Board, notifications for Issue activity won&apos;t be marked as read. Emoji reactions on Issues are currently only available using the ZenHub extension or native GitHub UI. If your organization has more than 1200 repos, the sidebar will not be responsive to quick-repo switching. The Epic builder is only available on the desktop version of the web app. When referencing Issues in comments, Issue suggestions will not be available. You will have to know the Issue number to reference an Issue. Issue events cannot be collapsed to minimize space between comments just yet! Drag and drop does not work on mobile. To move Issues between pipelines on mobile, you have to open the Issue and use the options menu to move it to a new pipeline. The R shortcut to head to Reports does not work on the Issue page. The F shortcut is coming soon! For now, you can use View Options under Board Settings to toggle fullscreen on and off. Issue event logs for adding an Issue to or removing an Issue from a Release are only displayed within the Issue history when using the extension.